Full Frontal talk, Daily and Nightly, about Last Week: Let's take a Closer Look. Speaking of which, I am DYING to hear the TDS and TN's take on Trump's bad week. The juiciest stuff seems to happen when they take a week off. Last edited by Daikaiju; 08-27-2016 at 12:45 PM. Can we add Seth Meyers to this? He might not be as good as Sam Bee or John Oliver, but he's getting there. I love his A Closer Look segment. I freaking love the legit anger Sam Bee brings every week. She is definitely playing more liberal pundit than fake news person but I love her for it. She's the MSNBC to The Daily Show's CNN of fake comedy news shows. Plus her not so gentle reminders about midterm elections. "Ya Done FUCKED UP, America!" Good night to good nightly. Looks like Wilmore was cancelled and his last show is this Thursday. Bummer. I enjoyed it when I watched it, but being opposite Colbert made that fairly rare. Farewell, Nightly. I appreciated CC rolling the dice with an African American comedian in a white-dominated space, but it never really clicked for me. I think it maybe skewed a little younger and the panel discussions never really drew my interest. I think we've got to see some contraction in Jon Stewart's political comedy offspring and Nightly always felt like the weakest of the lot. I think the larger issue was so much stuff (Ferguson, BLM, etc) happened as his show started, he had to address it. Plus being up against Conan/Colbert/Fallon who offered lighter (no pun intended) fare, kinda twisted the knife. I liked Nightly. The really cynical part of me thinks that there's probably some gross stuff at work like advertisers not wanting to go for two black-anchored comedy news shows back to back. Wilmore is talented. He'll land on his feet. Although it might be seen as a step backwards I think he could really help as a writer back on the Daily show. Pool those strengths, as it were. Yeah, reading the unfocused, inarticulate disdain being directed at Wilmore and Noah elsewhere makes me wonder if racism is a part of the problem. The really cynical part of me thinks that there's probably some gross stuff at work like advertisers not wanting to go for two black-anchored comedy news shows back to back. Numbers I saw this morning had him losing 60 - 70% of the TDS lead in. That's a death sentence (Colbert bled viewers from TDS too, but never even close to that badly). Crap, I remember his numbers being respectable, if not at Colbert's level. This was pre-Colbert Late Show, though, so I imagine a lot has changed since then. All of these programs are held in almost (but not quite) Borowitz Report-level contempt on twitter. I've seen Noah made fun of a lot along with John Oliver and, to a lesser extent, Samantha Bee. 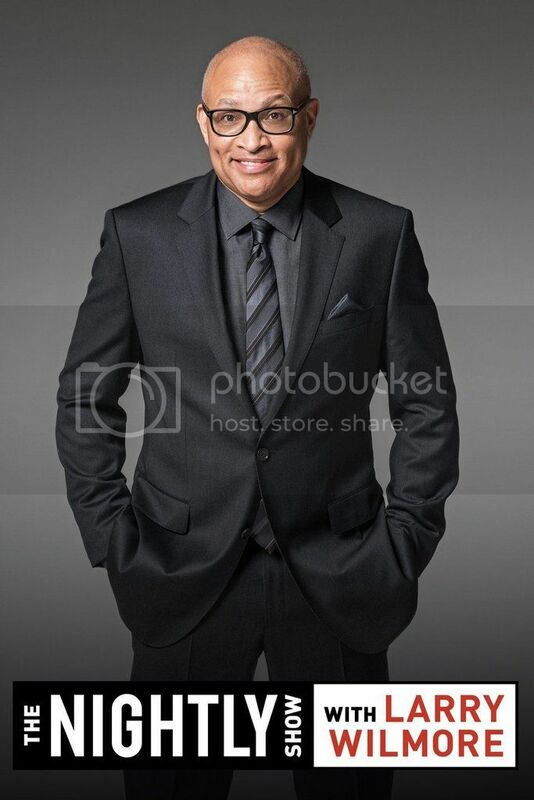 I never heard anyone talk about Larry Wilmore. I don't watch these shows and can't assess their quality. I'm just doing what I love most: relaying what I've seen on twitter. “The Daily Show” had an average of 2.1 million viewers a night in Mr. Stewart’s final year as host, while Mr. Noah’s audience has averaged 1.3 million, according to data from Nielsen. Critical praise has also been lacking for Mr. Noah; this year, for the first time in 16 years, “The Daily Show” was not nominated for an Emmy in the best variety show category. But Mr. Wilmore’s ratings have fallen off even more significantly, and he has lost more than half the audience that he inherited. In Mr. Colbert’s final year as host of “The Colbert Report,” he had an average audience of 1.7 million viewers, but in Mr. Wilmore’s first year, that viewership fell to an average of 922,000 viewers, according to Nielsen. This year, the total has fallen to 776,000 viewers a night. So he's losing more viewers from a smaller overall audience. Because it's weekly, John Oliver's show seems less interested in just making fun of the news and more concerned with actually bringing attention to topics that don't get a lot of buzz otherwise. I think it's a good approach that actually gets me to watch the show regularly. As the election has ramped up though, he's become more focused on that like everyone else. He still talks plenty about stuff that isn't the answer to "What's the hottest topic right now? ", which I appreciate. His show feels more like a fake news 60 minutes to the Daily Show's take on the nightly news. His deep dives are fantastic. Sam Bee kinda splits the difference. It's also weekly but has more of a long commentary feel. I think going weekly will help both of them in the long run. News commentary is a really saturated genre right now, especially if you count the trend of network late night shows becoming more and more political and less variety shows. Also, many is the time I would see Larry cover the exact same issue the TDS has just done 30 minutes before. It's almost like watching a rerun. I'm guessing that didn't help. Yeah, this was less of a problem with Colbert because he was a character and would have a different take on it. I enjoyed TNS having a panel and using their staff as actors various playing characters. And their in-house Trump impersonator is fantastic. And their in-house Trump impersonator is fantastic. That guy is scary good. First time he came on, my back was to screen and I thought it really was Trump at first. The Guardian has a good take. I feel the Nightly Show was at it's best editorializing and discussing the issues and at it's weakest when it comes to conventional comedy. I kept watching the show but found it to be a mixed bag in that respect (and when Larry would tag an already weak joke, I would cringe). And yes, they had a great Donald Trump guy, but I also found a lot of the conventional "sketches" were usually pretty weak. The debates between Mike Yard and... that other guy who is one of the head writers actually were interesting at first but it quickly became about the gag and the gag just got tired. The entertainment news bit with Robin Theade also got boring fast. So basically, when the show had something moving or really trenchant that was when the show worked best. When it simply tried to be really silly, that's when I think they tended to drop the ball. And there's nothing wrong with being really silly, but The Nightly Show wasn't very good at it in my opinion. Despite my complaints, it is a real shame it is leaving, because it did a really good job discussing race and the panel had some great guests and conversations. Also, I really like Francesca Ramsey, both on panel and on the Hash It Out segments. Also, while I disagreed with Mike Yard on a lot of things, I was always interested to hear what he said on panel. The most important question is where is Grace Parra going to end up? Oops, now I realize I confused Grace Parra with Robin Thede. My bad. I think Nightly was too focused on specific issues, and it felt like they were working with a threadbare budget from the start. Having said that, Comedy Central should have at least let Wilmore finish out the year. What will they be showing instead for the next three months? Reruns of At Midnight. Yeesh. I don't think the competing shows will have any trouble filling the vacuum, though. Samantha Bee is killing it on TBS, and John Oliver is awesome too (although his own coverage of specific topics makes it tough for me to tune in regularly). And of course Seth Meyers is finding his footing as a political commentator... I just wish he wouldn't smile so damn much. Hey, married people are allowed to look! "And how was your day?" And of course Seth Meyers is finding his footing as a political commentator... I just wish he wouldn't smile so damn much. Seth's grin is like Neal Adams' Joker. You'd need plastic surgery to remove it. Is everyone off this week? Nothing from Bee, nothing from Meyers. This stinks. He (Jon Stewart) then proceeded to laud Wilmore, quoting an unnamed executive from his past in saying, "Do not confuse cancellation with failure. What you were tasked to do, you have done, and done beautifully." Stewart also took a not-so-veiled shot at a Comedy Central executive who said that "The Nightly Show" hadn't "resonated," telling the host, "You started a conversation that was not on television when you began." Yeah, f the haters. It may have been weak in places, but when it was good, it was damn good. I'm going to miss it. Yeah, I agree. I personally did have some complaints on it, but it also brought to the table some excellent conversations and observations about the state of race, gender and social justice in America and in the world in a time where we REALLY need to talk about it. Interestingly, one of the things I disliked most about the early episodes, Keep It 100 (largely because it felt too often like they were looking for soundbites and I was annoyed in the first episode when NAS was trying to give a nuanced answer and Larry interrupted him to say "hey, keep it 100") ended up being moved to the end of the episode where it is more appropriate.